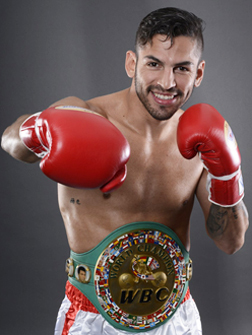 On such man is the highly talented Venezuelan Jorge Linares (34-3, 22), a man who has been affiliated with Teiken promotions through out his career. Linares returns to Japan on November 10th as he attempts to become a 3-weight champion and avenge the demons of an opening round blow out at the hands of Juan Carlos Salgado 4 years in what was his last world title fight in Japan. It's been a long time since Linares was beaten by Salgado and since then the once promising career of Linares has failed to ever really reach the heights expected of him. Sure he has won 7 contests but he has also lost 2, in fact he's he's lost in his two highest profile contests since the loss to Salgado. This time the risk of Linares being stopped is slim as he takes on WBA Lightweight champion Richar Abril (18-3-1, 8) a light punching but highly talented Cuban. In all honesty a stoppage loss here for Linares could well be the end of the road for him. Aged just 28 Linares has been a fighter on the radar for what feels like an eternity. That's because he's been in and around the world level for over 6 years dating back to his first world title victory, a stoppage of Oscar Larios for the WBC Featherweight title. Since then he has been in a further 5 world title fights, winning 3 and losing 2. On the flipside of that is the fact Abril is a bit of a late comer to the world scene. The Cuban only had his first world title fight 2 years ago and has only fought in 3 of them so far. Aged 31 he is older than Linares, though he's also tougher taking on, and in the eyes of many defeating, the rampaging Brandon Rios. When we talk about the two fighters they are both boxers, but both entirely different. Linares is a genuine joy to watch. He has quick hands, great movement, blistering combinations and whilst he's not a banger he can force stoppages through sheer work rate. On the reverse he's been seen as fragile both mentally and physically and he can be bullied around as well as worn out due to his work rate. Gorgeous to watch but certainly not a "warrior" at heart. On the other hand Abril can be awful to watch. He can hold, he can wrestle, he can make things very messy and tedious. At the same time however he can pick a guy apart with an accurate jab, an efficient straight and land some amazingly crisp and sharp shots around a fighter defenses. At his best Abril is a fantastic pure boxer and his worst he's a cure for insomnia. Strangely we can see both sides of Abril in the same round which can lead to a lot of frustration watching him. If fights were won on looks alone Linares would already have this one won. In the ring however the Cuban will make this very difficult. If Abril is allowed to get his jab going and allowed to hold when he wants to to slow the pace the Cuban will likely retain his title. If Linares however can set the pace for the first 7 or 8 rounds then Teiken will have managed to guide him to a third divisional title. This bout really does depend on who can dictate the tempo of the fight. A slow fight is Abril's a fast fight is Linares's. With that that said however Linares will almost certainly know that this will be his last major chance. He needs a win. That sort of pressure can see a fighter performing to their absolute best and if Linares does, then he takes this via a competitive clear decision. If the pressure gets to Linares than Abril gets this via a close decision.